See the staff at the front office during your stay for daily password. Everything you need for an enjoyable stay. Welcome to the Coconut Grove Holiday Apartments! 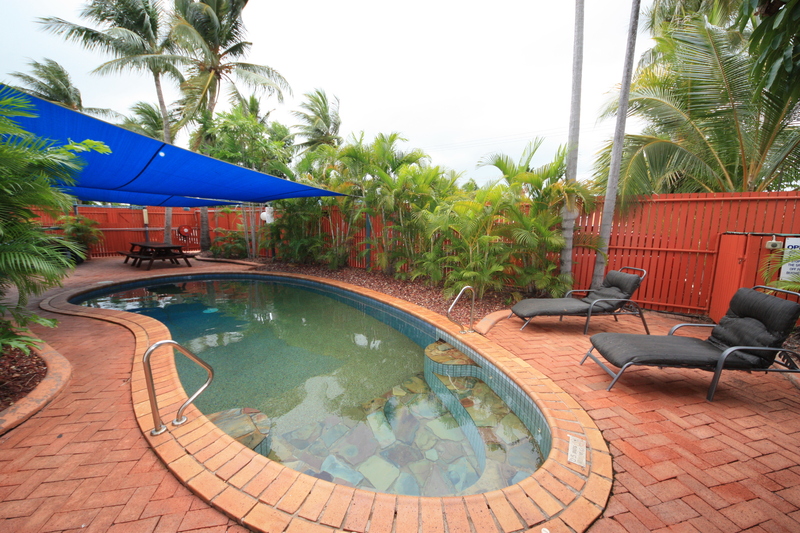 Just six kilometres from the airport and a fifteen minute drive to Darwin city, Coconut Grove Holiday Apartments are set amidst a lush garden of tropical ferns and palms; a perfect setting for you to relax and enjoy the lifestyle of the Top End. 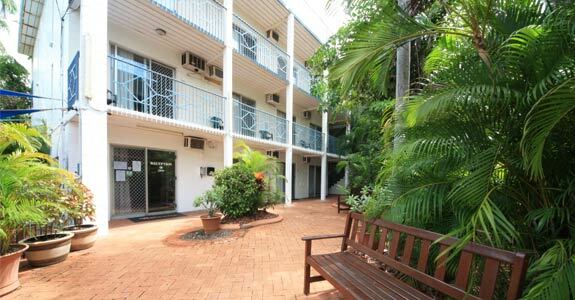 Close to the Casuarina Shopping Centre and only minutes from city shopping, restaurants and Darwin's exciting nightlife district, if you are looking for quality and affordable accommodation in Darwin, Coconut Grove Holiday Apartments are for you. You can choose from one, two and three bedroom self-serviced apartments, all with the conveniences of home and ideal for short or long-term stays. All apartments have full kitchen facilities which are serviced weekly. Families are especially welcome with interconnecting rooms and cots available for your convenience. A comprehensive range of tours are displayed in the reception foyer, including tours to Kakadu. You will find our knowledgeable staff happy to help you with tour bookings and advice. The quality service and warm welcome you will receive at Coconut Grove creates the perfect atmosphere for you to enjoy Darwin. 1 Queen bed or 2 single beds. Air conditioning, tea & coffee making facilities, cable TV and refrigerator. Max 2 people. Please be aware there are no lifts on our property, upper levels are accessed via staircase. Motel Rooms are located on upper levels only. 1 Queen Bed and 1 Single Bed. Full Kitchen, Air conditioning, tea & coffee making facilities, cable TV and refrigerator. Max 3 people. Please be aware there are no lifts on our property, upper levels are accessed via staircase. Queen One Bedroom Apartments are located on upper levels only. 1 King Bed and 1 Sofa Bed. Superior Furnishing, Full Kitchen, Air conditioning, tea & coffee making facilities, cable TV and refrigerator. Max 4 people. Please be aware there are no lifts on our property, upper levels are accessed via staircase. King One Bedroom Apartments are located on ground floor and upper floors. King Deluxe One Bedroom Apartments are located on ground floor. 2 Double beds, 2 single beds and 1 Bunk Bed. Full kitchen, air conditioning, tea & coffee making facilities, cable TV and refrigerator. Max 6 people. 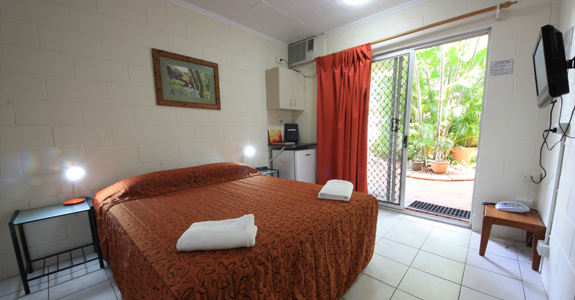 Please be advised that our 2 Bedroom Apartments contain 1 bathroom, which is only accessible through the main bedroom. Please be aware there are no lifts on our property, upper levels are accessed via staircase. Two Bedroom Apartments are located on upper levels only. 3 Double beds, 2 single beds and 1 Bunk Bed. Full kitchen, air conditioning, tea & coffee making facilities, cable TV and refrigerator. Max 9 people. Have a chat to us! 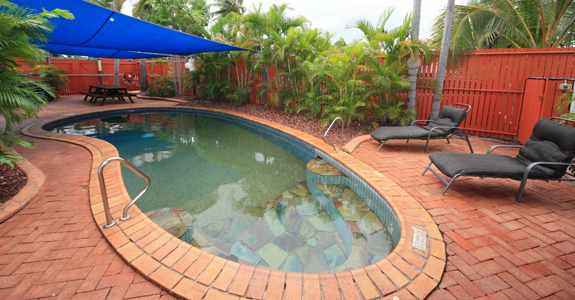 Located right in the centre of all of Darwin's atractions and only 5 minutes walk from shops.